As a historic personality St. Martin’s existence is well documented and unquestionable. The patron saint of France, he became famous and venerated throughout the world as an example of charity and humanity. There is the famous legend that as a Roman knight he rode past a freezing beggar, took his sword and cut his coat in two halves, one of which he gave the beggar. His commemoration day is November 11th. That was the day when his body three days after his death was transferred in solemn candle-light procession up the Loire river to Tours, the city where he had been bishop for many years. 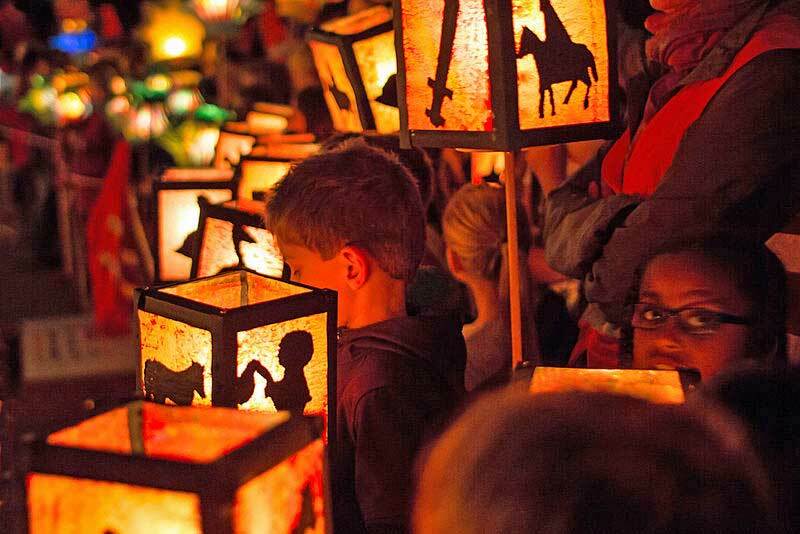 On the evening of November 11th children in many places of the world proceed over streets and squares carrying home-made lanterns. Doing so they sing songs devoted to the saint and recalling his life. Holy Martin left many traces behind him. Parishes, churches, chapels, wells and also social institutions bear his name. 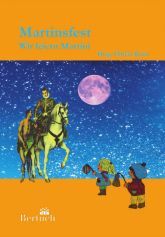 In the German-speaking countries alone there are more than 40 places called "St. Martin" and, as in the Saarland place of Tünsdorf, inform the visitor that the saint lived and worked there and contributed to its reputation. Several legends formed around his life and work. Some even maintain that he raised people from the dead. The historic Martin was born in A.D. 316 or 317, the son of a high-ranking Roman officer in Sabaria, Pannonia, today Szombathely, Hungary. He spent most of his childhood in Pavia in Northern Italy, the homeland of his father. There he came in touch with Christianity for the first time. According to an imperial decree as the son of an officer he was obliged to become a soldier and serve in the military for 25 years. At 15 years old he joined the body guard of the emperor Constantine II (316-340) in Milan. Later he served as a soldier in Gaul and also in Germanic areas. In the year 355 Julian, later in Christian history known as Julian the Apostate, became supreme military commander in those areas. 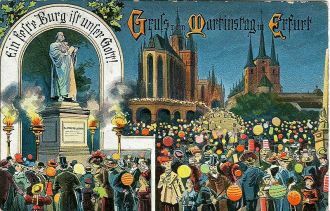 When he ordered his soldiers to attack the city of Worms, Martin refused to obey and applied for his release from the army. He said he had been transformed from a soldier of the emperor to a soldier of Christ. When he was 40 years of age he began a new life as a man of the church. He had himself baptized by the bishop of Poitiers, was ordained priest and lived the life of a monk and hermit. He must have been a very modest and unusually charismatic man. Wherever he stayed followers and supporters gathered around him. Primarily in Gaul in the area of Touraine his reputation spread as a benefactor, helper and trustworthy witness of the Christian faith and teachings. 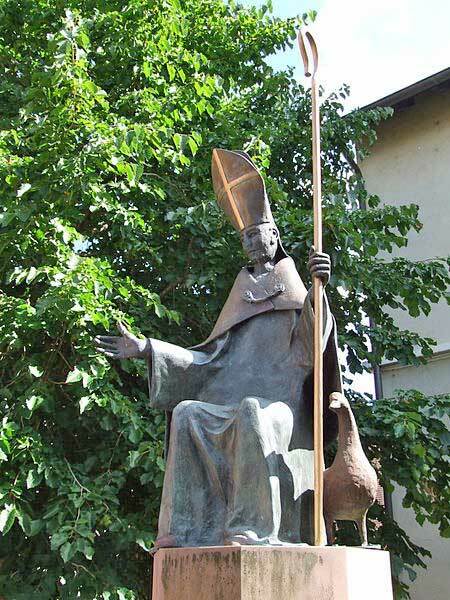 He travelled widely, visited his place of birth and converted his mother to Roman Catholicism. In Ligugé he founded a community of hermits, the first monastery in Gaul. Today it is called Abbey of St. Martin of Ligugé. 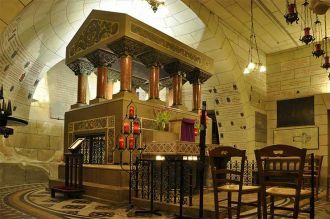 It is operated by Benedictine fathers and is a popular place of pilgrimage. He founded another monastery in Marmoutier, outside Tours, to which he withdrew whenever possible. He had lived some years before in that area as a hermit in a cave. But believers followed him there, too. In 1372 when a new bishop was needed for the bishopric of Tours, word got out that he was working in the area, and he was elected to the position. A legend says that he felt himself unworthy of the office. Therefore he hid in a goose shed, but the geese betrayed him by their honking, thus providing the basis for the tradition of the Martinsgans meal, which believers and even non-believers indulge in around St. Martin's Day. Having been made a bishop did not prevent Martin from activity in many areas. He served as negotiator between the Roman emperor and the Franks, fought the teaching of Arianism ("There is only one God, the Father"), worked in the field of church politics and founded a number of parishes. He was in constant contact with the Christians in his diocese and mediated many a dispute between quarrelling church members. During such a reconciliation talk he died at the age of 81 years in 397 in the small parish of Candes in Gaul, which today bears the name "Candes St. Martin" and is to be found in Centre-Val de Loire (Central France). 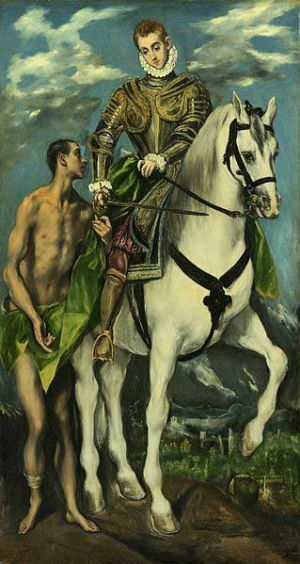 - St. Martin and beggar, painted by El Greco, ca 1597-1599, Öl auf Leinwand, heutiger Standort: National Gallery of Art, Washington. 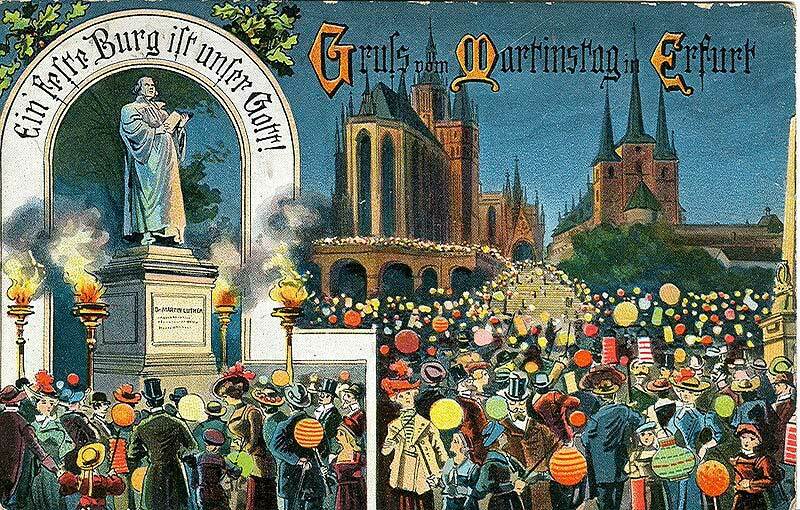 - "Greetings from the St. Martin's Day in Erfurt". Postcard, dated 10.11.1913.